Well, let’s see here… I’ve fallen a bit behind once again. After finishing up the aero install, I received my 25mm spacers and DMAX catback exhaust. I installed the spacers up front to dial in some more camber and finally get my wheels to clear the front springs. Once that was finished and the exhaust was bolted up, I pulled the car out of the garage for a couple quick snaps to see what I thought of the new look. With confirmation that spacing the front wheels out 25mm would be OK, I finally decided on installing some front suspension components from GK Tech. I had purchased their front roll center adjusters a couple months back, but bailed in favor of S14 front control arms. In the end, I thought it would be best to correct the suspension geometry as much as possible while also spacing the front wheels out a bit. The GK Tech kit seemed like the best of both worlds. It’s nice that it corrects roll center and allows you to remove some preload from your springs while keeping the car fairly low. I also opted to install a pair of GK Tech front tie rod ends to correct bump steer. After installing these parts, I found that my front wheels were still rubbing on the coilover springs. After a bit of research, I found that the two holes on the lower bracket that bolt to the front knuckle were too close to the body of the coilover, causing the wheel to hit the springs- even with the track width widened 25mm. This seems to be an issue with more generic S13 coilover setups. I removed the suspension from the car and finally decided to bite the bullet and upgrade to something a bit nicer. 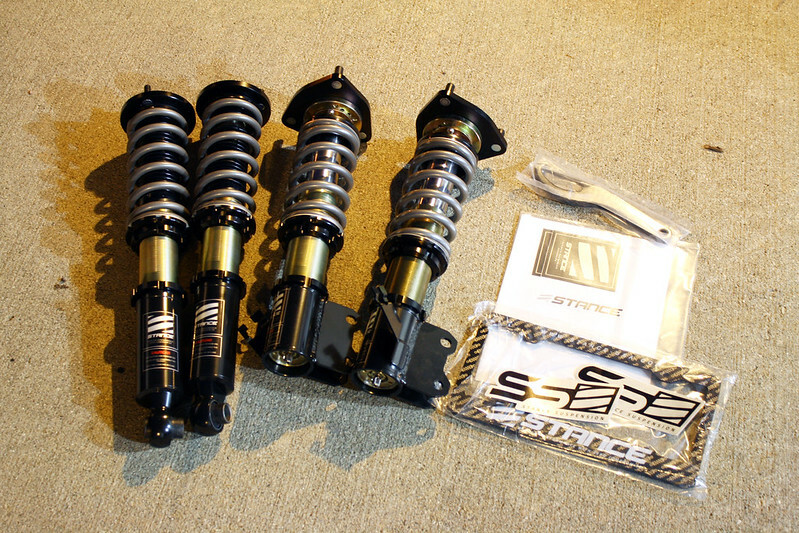 I reached out to a friend at Touge Factory and picked up a set of the newly revamped Stance Super Sport coilovers. 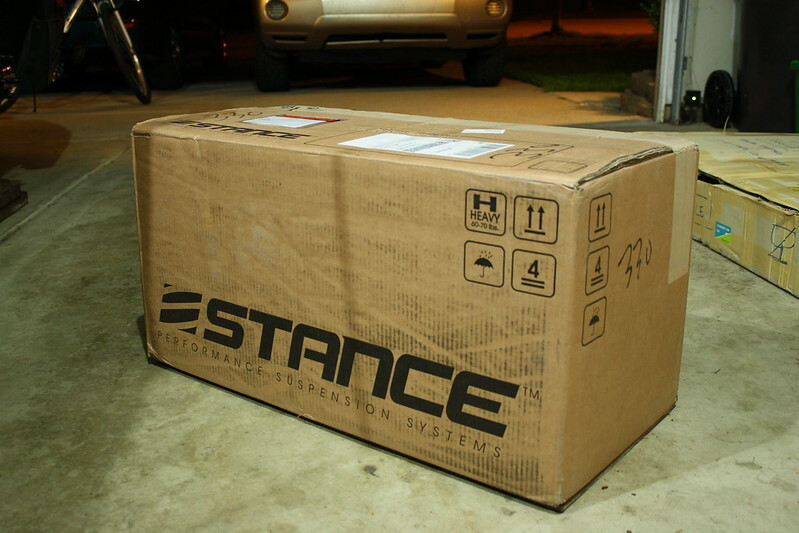 I’ve always heard good things about Stance products but had never tried them for myself. The main aspect that drew me to them was the fact that their lower bracket design was far nicer than my previous coilovers. The knuckle bolt holes were much farther out on the lower bracket, preventing my wheel from hitting the spring. My proximity to Touge Factory (located outside of Chciago) was an advantage in this case. The coilovers arrived quickly, allowing me to avoid a few days of downtime waiting for parts to arrive from the West coast. I was really impressed with the box and packing materials. Most people don’t notice or care about things like this, but as a graphic designer I always have a nerdy appreciation for these things. The new color scheme on Stance’s coilovers is quite classy. All of the components felt more durable and looked beefier than my previous setup. I especially liked the larger collar design. The camber adjustment on the front top hats is also much nicer than anything I have used in the past. The coilovers came with spanner wrenches, instructions, a few stickers, and a license plate frame. Installation went rather smoothly. I did have to remove one collar up front and add a bit of preload to the spring to achieve the ride height I was after, but thankfully I didn’t have to flip the front brackets. Height adjustment was smooth and the coating/finish on all of the components is super nice as well. I opted to install my Kics 11mm spacer on the rear of the car to bring the effective specs to 18×9.5 +11, very close to the specs of my old silver TEs. I had to add a touch of camber as a result, but it looks nice with the added camber up front. I was headed to my in-laws’ house for the weekend and decided to drive the S13 about five minutes after finishing the suspension adjustments. Despite the fact that I need a proper alignment, I am seriously blown away with how the car drives now. The combination of the Stance coilovers and the GK Tech components makes a noticeable difference in how the car drives. Bumps are much less harsh and dampening is very effective. Everything feels less bouncy/harsh all around a number of the clunks and noises I would hear from time to time seem to have disappeared. These are by far the best coilovers I have ever used on my S13. I didn’t expect to notice much of a difference, but I am pretty blown away! While I was at it, I also replaced a wheel bearing that had gone bad up front while I had the car in the air for the suspension install. I also took the time to trim and install my brand new OEM fender liners that I picked up recently. I had a similar setup a few years back and really liked how it cleaned up the overall look of the car. At this point the S13 is largely complete- for now. I still need to install the 180SX headliner this week. I ended up selling my set of AVS Model Vs- while I wanted to see them on the car, it just didn’t really make sense to keep them around. I knew that I liked the TE37s better, so I figured it was best to let them go. I had planned to use the Model Vs as drift spares, but after looking at the calendar I am not sure when I’ll realistically be able to make it to Shawano again for another Club FR event. To be completely honest, my NISMO two way has been fairly annoying on the street. While I really am interested in trying drifting, a part of me doesn’t want to drift this car. While it seems casual, it’s a fairly big commitment for me that I’m just not that sure I am really up for. I’ll continue to cruise around town like I always do and who knows- maybe I’ll give it a shot at some point, or maybe I’ll think better of it. Next on the list is an alignment and installing my headliner. Looking forward to enjoying the car a bit more as the weather finally improves (it was snowing last Sunday.) Thanks for stopping by! I love Stance coilovers, good call ! Been using them on several different cars over the years. The new ones look really cool and well built. 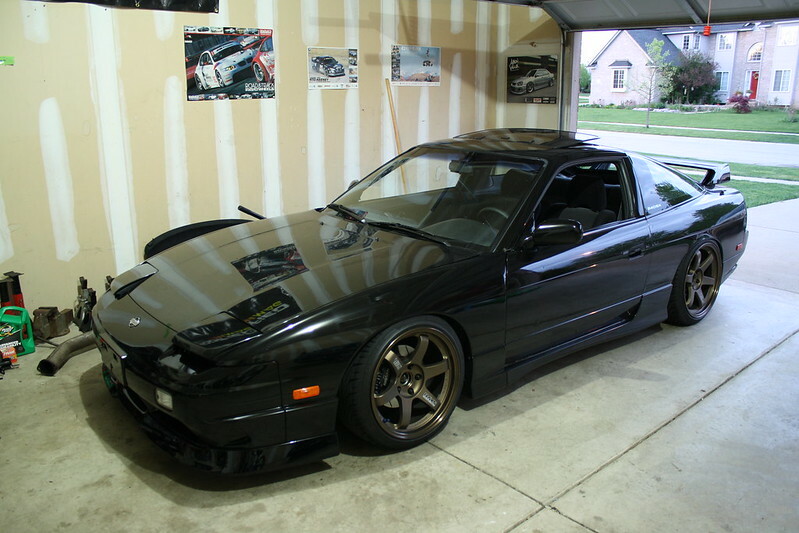 I stumbled across your blog doing research for my s13. I would love to meet up sometime and see your car in person. I am also close to Chicago. Nice! Yeah I am about 3.5 hours from Chicago. I’ll be at Final Bout up in Wisconsin next month if you’re going to be there!